The Gotta Love It 7 team of Seve Jarvin, Sam Newton and Scott Babbage grabbed the lead back in the 2014 JJ Giltinan 18ft Skiff Championship, proudly presented by Sydney City Marine, with a marvelous win in Race 4 on Sydney Harbour today. After being buried deep in the pack at the start, the champion team were soon in contention and challenging the leaders half way up the windward beat. Gotta Love It 7 took the lead on the following windward leg and edged away to take the honours by 1m37s from a gallant Mojo Wine (Chris Nicholson, Mike McKensey, Ricky Bridge), with Smeg (Nick Press, Dan Phillips, Dave Ewings) a further 1m9s back in third place. Race 3 winner C-Tech (Alex Vallings, NZ) was always in the leading group and came home in fourth place, ahead of fellow New Zealander Yamaha (David McDiarmid), Appliancesonline.com.au (Micah Lane), Fisher & Paykel (Grant Rollerson) and former series leader Thurlow Fisher Lawyers (Michael Coxon) in 8th place. Points leader Gotta Love It 7 has a total of 15 points, followed by Thurlow Fisher Lawyers on 17, C-Tech on 22, Mojo Wine 26, Coopers 62-Rag & Famish Hotel (Jack Macartney) on28 and The Kitchen Maker (Will Phillips) on 32. Following some disappointing wind conditions over the earlier days, today’s race was sailed in a #2 rig North-East breeze. Mojo Wine, C-Tech and Smeg were all well placed at the start and soon were vying for the lead, along with Fisher & Paykel. 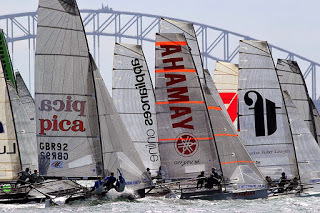 At the Beashel Buoy, Mojo Wine held a narrow lead over C-Tech and Gotta Love It 7, with Fisher & Paykel, Smeg, Thurlow Fisher Lawyers and Yamaha close behind. In the 18-knot wind, the 34-boat fleet made a magnificent spectacle as the skiffs raced downwind at great speed. Mojo Wine still held the lead at the bottom mark but couldn’t hold off the Gotta Love It 7 challenge when the pair crossed off Clifton Gardens. As the cloud built, the wind may have dropped a little but it made no difference as Team Seven continued to lead the fleet over the final lap of the course. Race 5 of the championship will be sailed tomorrow (Thursday). The last two races will be sailed on Saturday, 8 March at 4pm and Sunday 9 March at 3pm. A spectator ferry will follow all races, leaving Double Bay Wharf 30 mins. before the scheduled start time. NOTE: There will be two spectator ferries on Sunday 9 March. Centrally located underneath the ANZAC Bridge in Rozelle, Sydney City Marine is one of the most professional and environmentally sound yacht maintenance yards in Australia. Whether you own a recreational powerboat or yacht, a racing yacht or dinghy, a super yacht or commercial vessel, Sydney City Marine can offer you a complete marine service from antifouling, boat detailing, painting and electrical to all repairs and maintenance.